These might just be my favorite cookies ever. I made them a couple Christmases back and have thought about them frequently ever since. 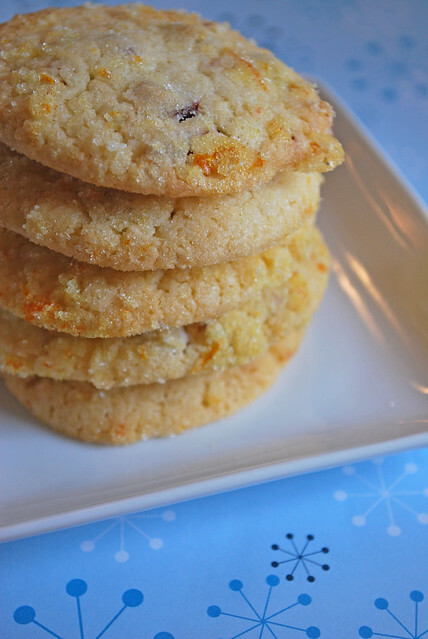 They are a light and delicious sugar cookies with dried cranberries and tons of orange zest. They’re also rolled in a mixture of sugar and orange zest which is what makes them so good. The sugar make them a little crunchy on the outside but they say so soft on the inside. Good stuff. They are also super simple. My 2 year old and I did made the dough and baked them off in probably 30 minutes, and if you have kids you know everything takes longer with them helping. Using an electric mixer, mix butter and 1 cup sugar until light and fluffy. Add egg. In a separate bowl, combine flour, baking powder, and baking soda. Add to butter mixture and mix until just combined. Fold in cranberries and 1 tablespoon orange zest. Chill dough while you make orange sugar. Combine 1/2 cup sugar and 1 tablespoon orange zest. Use your fingers to rub the 2 together until everything is combined and mixture is fragrant. Shape dough into 1 inch balls and roll in orange sugar. Place on baking sheet and flatten slightly. Bake 10 â€“ 13 minutes or until lightly golden. Cool on wire racks. 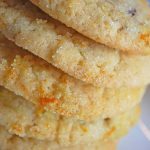 53 Responses to "Cranberry Orange Cookies"
I have really enjoyed all the cookie recipes you have posted. Such amazing things coming out of your kitchen. 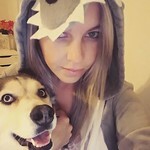 .-= Sarah´s last blog ..Simple, Yet Delicious =-. I’m always looking for a recipe that is citrus-y and new – this seems to fit the bill. Great job on this cookie! .-= Jenny´s last blog ..Epic Failures: Fall 2009 =-. .-= Joy´s last blog ..Daring Bakers Challenge – A Gingerbread House =-. I am always on the look-out for cookies and cakes that my hubby will like and this one looks like a winner. .-= Chaya´s last blog ..He Did It By Himself Chicken =-. 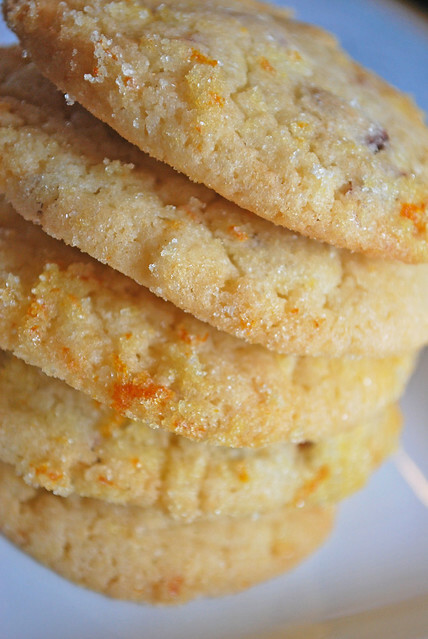 These look delicious – the orange zest gives them a lovely appearance. Will give them a try. These look lovely … will have to give them a try once oranges come in season here. 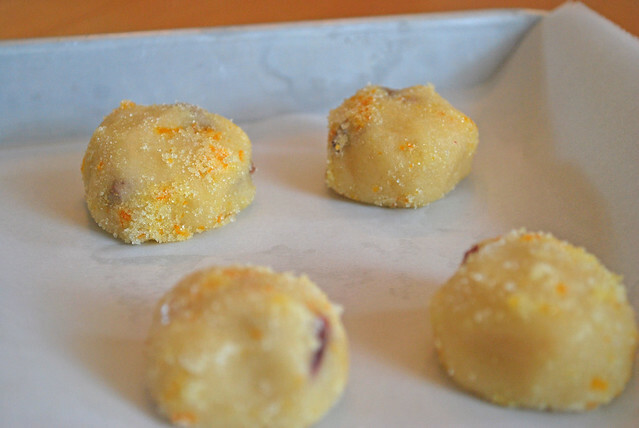 .-= Trisha´s last blog ..Week 1 of 12 Weeks of Christmas Cookies- Cranberry Noels =-. Does this recipe only make one dozen? Sorry if this is a dumb question….this will be my first time baking cookies from scratch. I’m not really sure (I really should’ve done a better job keeping track of all that!) but I wanna say it makes about 2 dozen. You picked a good recipe as your first from scratch one! This is definitely one of my favorite holiday cookies! Baked all day today for my Airmen’s annual cookie drive, and used three of your recipes including this one. Saved a couple for my husband, and he cannot get over how good these are (I quite agree). Also made the gingersnaps and salted chocolate peanut butter cookies. Both so good! Found your blog last year through Pinterest and I cannot tell you how many times I come back here. You are my online cookbook :) Love your blog. aww, thanks! I’m glad you commented – I’d forgotten abut these! Getting ready to make these for the second time. They’re so good. Light and slightly sweet. Just loved them! Just curious, fresh or dried zest? And if fresh, about how many oranges would that take? Made these today. Although I love the flavor combination, I find them to be a little on the dry side. Hmmm? Mine weren’t dry at all. Did you love the flavor enough to try again? I took mine out of the oven even though they appeared they might be underdone (browned but soft in center) but when cooled they were perfect. I made these and added white chocolate chips, they were awesome!!! These are REALLY, REALLY delicious! I was searching for recipies to use up some oranges and came upon this recipe. Crunchy on the outside, soft in the middle. Yummy! Have made these 3 times — once at Christmas and 2 times to take to the office. They are wonderful! The girls at work only have one complaint — they are addicting. Definitely a recipe that I will keep on hand. made these 3 years running. Delightful crispy edge tender center cookie. A beautiful change of color and flavor for variety on your cookie table. I bake 18 types of cookies each year for 3 parties and these are always an unexpected surprise. Mine got crunchy after they cooled…..did I bake them too long? Yeah, probably a bit overbaked. They should be pretty soft. Would this recipe work with dried zest? Thanks. I’m really not sure – I’ve never worked with dried zest. Can you soak it in water to kind of plump it up? I wish I was more help! I’m not sure I just made these and my dough is flakey and dry. Am I missing something? Looks like it needs a liquid more than just 1 egg? Any ideas? just ate one from my first batch. Hands down the best cookie I’ve ever made or eaten. I love these cookies. The thing I did differently was a I added a orange zest glaze. It added a nice touch to the last. I still need the sugar zest in addition to the glaze. Husband loves them! Thanks for sharing. these look delicious! can you freeze the dough? I loved your cookie, I made it today and doubled the recipe for a New years party. I just tasted it and it’s light and fluffy and super yummy. The only thing I used different was mandarin oranges becuase its what I had. Thank you so much for sharing! These cookies are delicious! Thank you for sharing the recipe. Made the coonkies, found that my batter sticky, The cookies were very thin. I added a little four, made a big difference. Delicious, the family loves them. Love these. I made them last year for Christmas and I’m making them now for this Christmas. I didn’t have any problems with this recipe at all. These turned out amazing! I made small bite size cookies and got roughly 50 per batch. They are light, fluffy, flavorful and DELICIOUS! I can’t wait to take them for my cookie exchange tomorrow. Could I use fresh frozen cranberries? I don’t think so. I imagine they’d have too much liquid in them. I made these using orange marmalade I. The dough instead of zest ( too lazy to go buy orange) and they turned our amazing and delish! Wish I could post A picture. I’m wondering about the dried cranberries – can I use a product like craisins? Thank you so much for your recipe Amanda! I just bake them and they are truly delicious! I send you a big hug from The Netherlands! Yay, I’m so glad you enjoyed them! I have made these numerous times and they are delicious. Not heavily flavored which is what I like. Put white chocate chips in sounds like a great idea for a little extra punch. I usually get close to 3 dozen for a single recipe. I love the white chocolate chips idea!